The Anglican Churches of England and North America were very interested in the discussions about the First Vatican Council taking place in Europe at the time. The evangelical wing of the English Church saw common cause with the Old Catholics primarily in their opposition to Rome; the anglo-catholic wing on the other hand assumed rightly a commonality with Old Catholics in their keeping the tradition of the “old,” undivided church of the first millennium. The first Bonn Union Conference (1874) accepted fourteen theses, formulated primarily by Döllinger. The question of the validity of Anglican Orders remained an open one at the Conference. 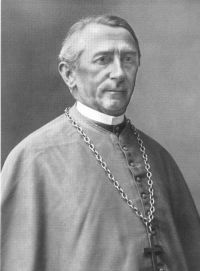 Joseph Hubert Reinkens, elected and consecrated (1873) first Bishop for Old Catholics in the German Reich, as well as Döllinger saw no difficulties in the recognition of Anglican Orders, but the Orthodox participants at the Union Conference were more hesitant. Within Old Catholic circles themselves the question of the validity of Anglican Orders proved to be the main hindrance to further agreement. This remained an issue until 1931 when a conclusive agreement was finally reached. The Bonn Union Conferences provoked varying reactions in the Church of England: for the evangelical wing of the Anglican Church they were too Catholic and the anglo-catholics on the other hand feared that a closer relationship with Old Catholics could hinder closer relations with Rome. Moreover, there was a general consensus that the Conference was conceding too much to the Orthodox (in particular in the question of the filioque). 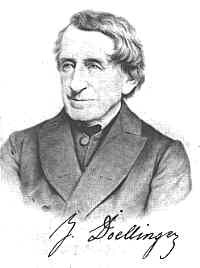 The strident reactions of anglo-catholics in the press, like that of Edward Bouverie Pusey, led to Döllinger’s decision not to call a third Union Conference. Nevertheless the conversations at the Bonn Union Conferences made it clear to everyone that Old Catholics, Anglicans (and the Orthodox!) have distinct theological commonalities in spite of their different historical backgrounds. Between 1870 and 1880 Anglican – Old Catholic relations were characterized by a mutual interest in and good will for each other. The Old Catholic Bishop of Switzerland, Eduard Herzog, proclaimed ecclesial fellowship with the Anglican Church of Scotland and the American Episcopal Church in 1879/80. In 1883 the German Synod welcomed all members of the Church of England to receive Holy Communion in both kinds (i.e. bread and wine) in Old Catholic parishes. In spite of such efforts to establish contacts there were also setbacks. Along with these closer relations there was also some stagnation: The Old Catholic Church of the Netherlands was more reticent in pursuing closer relations with Anglicans and did not accept the validity of Anglican Orders. This led to putting union plans on the back burner. After the Old Catholic Bishops self-organized into the Union of Utrecht in 1889, important issues and questions such as this could only be dealt with by the whole Union. Even more important than this decision was the promulgation of the so-called “Lambeth Quadrilateral” by the Lambeth Conference, which expressed the position of the Anglican Church with regard to questions of reunification. These four things serve as a basis for reunification: the Holy Scriptures of the Old and New Testament, the Apostles’ Creed and the Nicene Creed, the sacraments of Baptism and the Eucharist, as well as the historic Episcopate. If churches are to attain greater unity with each other, then it cannot remain a matter for deliberation in theological studies or bishops’ conferences alone, but rather needs the support of the whole church. In this regard the Anglo-Continental Society in England was seminal in translating Old Catholic theological tracts and making them available to a larger public throughout the 1870’s. In 1908 the “Society of St. Willibrord” was founded in England. Its task was to encourage and facilitate parochial contacts and thus increase mutual knowledge and understanding between Anglicans and Old Catholics at the grassroots level. Today Willibrord Societies are active in many different countries. On September 7, 1931, the International Old Catholic Bishops’ Conference accepted this agreement for inter-communion and on January 20 and 21, 1932 the Convocations of Canterbury and York ratified the agreement. In the following years all of the Anglican provinces followed the example of the Church of England. The concept of “inter-communion” used in 1931 was changed to “full communion” in 1961 in conformity with the standardization of ecumenical terminology established at the third World Conference of Faith and Order held at Lund in 1952. During the Third Reich it became very difficult to maintain relations; in some instances it was practically impossible. Following the Second World War and stemming from a increased presence of British and American Anglicans who came into the country as the occupying powers, new relations between Anglicans and Old Catholics were established from place to place. Since the beginning of the 1950’s Old Catholic parishes support Anglican missionary and development projects with money and materials. In 1965 the Bonn Agreement was extended by the Old Catholics to include the Philippine Independent Church, the Reformed Episcopal Church of Spain and the Lusitanian Catholic Apostolic Evangelical Church of Portugal. Again and again, however, the relations were strained. The difficulties came about for different reasons, not the least of which was the fact that the Bonn Agreement, after establishing a fundamental theological consensus, failed to offer suggestions for filling the agreement with life in a practical sense. We have had to learn from experience that it is good mutually to consult or inform one another about internal developments. In 1998 the Archbishops of Canterbury and Utrecht founded the “Anglican – Old Catholic International Coordinating Council” (AOCICC). It is the task of this council to discover how and in what ways an increased cooperation is possible. In pursuing that goal the members of the council inform each other at annual gatherings about on-going developments in their respective jurisdictions. They also exchange information about the status of ecumenical relations to other churches. In addition recommendations about continuing cooperation emerge in deliberation and are forwarded to the respective churches. Initially the Council was given a mandate for five years; since 2005 the council continues its work in a new configuration and with a new mandate. 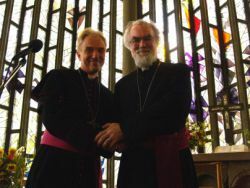 New emphasis is being placed on dealing with ecclesiological issues as well as on encouraging more cooperation between neighboring Anglican and Old Catholic parishes in Europe. These and other issues are in deliberation, whether in the AOCICC or at gatherings of European Old Catholic and Anglican bishops which now take place regularly. A central issue currently concerns the form of a common witness of Old Catholics and Anglicans in Europe. Trust is the foundation of all cooperation. That foundation has already been established in the Bonn Agreement: trust that the other church in all its distinctness and sometimes even its strangeness lives out its catholicity. Old Catholics and Anglicans have much to give each other – theologically, spiritually and practically. Summing up, we might say that the main thing is that we strengthen each other mutually in our catholicity. An essential feature of that is the consciousness that being Catholic always involves reform and renewal. In this endeavor we can and should be a critical corrective for each other. True siblinghood is not revealed in mutual admiration, but rather in loving criticism and in an openness infused with affection. Cf. Angela Berlin, Frauen im Prozeß der Kirchwerdung. Eine historisch-theologische Studie zur Anfangsphase des deutschen Altkatholizismus, Frankfurt a.M. 1998. Due to limited space a discussion of Anglican interest in the Church of Utrecht is not possible. Cf. John Mason Neale, A History of the So-Called Jansenist Church of Holland, Oxford, 1858. As expressed by Victor Conzemius, quoted in Peter Neuner, Döllinger als Theologe der Ökumene, Paderborn, 1979, 178. Citation of the Declaration in Küry, Die Altkatholische Kirche, 466. Citation of the Declaration in Küry, Die Altkatholische Kirche, 467. Citation of the Declaration in Küry, Die Altkatholische Kirche, 468. We cannot delve into the background of this change of stance. It took place within the context of an ecclesiastical and theological renewal of the Old Catholic Church of the Netherlands at the end of the 19th century. Citation of the Declaration in Küry, Ibid. Cited by Frei, Die altkatholisch-anglikanische Vereinbarung, 215. Citation of the Minutes of the Union Conference of July 2, 1931 in Bonn in Küry, Op. Cit., 468-478. Citation of the text in Ibid. 477f. ; Harding Meyer, Hans Jörg Urban, Lukas Vischer (Ed. ), Dokumente wachsender Übereinstimmung. Sämtliche Berichte und Konsenstexte interkonfessioneller Gespräche auf Weltebene 1931-1981, Bd. I, Paderborn – Frankfurt, 1983, 77-79. Lukas Vischer, Das Bonner Abkommen von 1931 im Lichte der ökumenischen Bewegung, in IKZ 71 (1981), 237-253, here 240. The contributions of this conference were published in a special issue of the IKZ in 2007. Christen Heute, Zeitschrift der Altkatholiken 50 (2006), 224.